Cormac McCarthy’s Pulitzer Prize-winning and poetic novel is a difficult read both in content and prose, but is worth every effort to complete. McCarthy’s economy of words and minimalist writing style leaves a context full of meaning, much of it sorrowful. 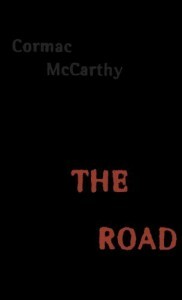 The writing in The Road intentionally lacks the flair of modern novelists, removing the wordy descriptions, bantering dialogue, and even common punctuation. What’s left on the page is heart-rending narrative laid bare in its naked prose. This does not make for a quick or easy read. The intent of McCarthy’s style is mostly understood, except for a few caveats. Some sentences are punctuated with commas; others are broken apart with periods, allowing adjectival phrases to stand on their own fragmented merits. Most contractions retain their apostrophe, but the apostrophe is missing in any word contracting “not” (wouldnt, dont, cant). But the most confusing aspect of McCarthy’s writing is the change in narrative, not just from different third person narratives, but at least one paragraph switches to the first person narrative (page 115 in the paperback version). The artistic merit of the novel stands strong. The movie The Road does a great job of clearing up the flashbacks that aren’t clearly defined in the book, but it does not retain the powerful meaning of the book itself. Both are heavy to the soul, but the book stands alone when compared side-by-side. If you are looking to expand your reading level or are seeking to enrich your life through written mediums, then The Road is a definitely needed addition to your list. If you are looking for a cheerful or quick read, you’ll be better served elsewhere.